Fibre is made up of the indigestible parts or compounds of plants, which pass relatively unchanged through the stomach and intestines. Fibre, also called roughage or bulk, is necessary to promote the wavelike contractions that move food through the intestine. Producing more bulk stimulates the transit of waste through the gastrointestinal tract. As fibre passes through the intestine undigested, it absorbs large amounts of water, resulting in larger, softer and bulkier stool. A softer, larger stool can help prevent constipation. water thereby producing more bulk, which stimulates the transit of waste through the gastrointestinal tract. 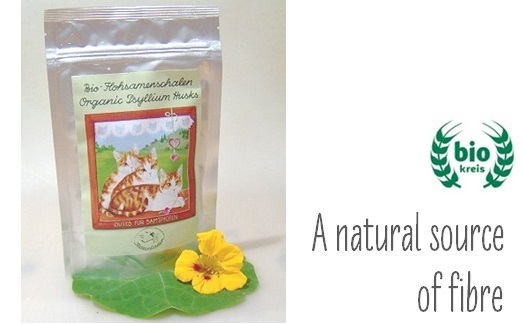 In a 1,000 gram homemade catfood recipe 1-2 teaspoons of Psyllium Husks is added for fibre. Mix Psyllium with water, and let it sit until it gels. Please don’t overdo. Always increase fibre levels slowly, while monitoring your cat. Cats that receive higher fibre ingredients may develop diarrhea. Psyllium MUST always be taken with plenty of water. Psyllium products may interfere with the absorption of other medications and supplements, and so should be taken at least 2 hours before or after other medications. Do not use Psyllium if your cat is suffering from intestinal obstruction or if she/he has any development of obstructions in the intestinal tract.